Should university LGBT centers refer students to ex-gay groups and conversion therapists if they ask for it, or do counselors have a responsibility to caution students against trying to change their sexual orientation? Colleges in Virginia seem to have opted for the latter, leading conversion advocates to call foul and say that schools have a burden to present “both sides” of the issue. Public universities in other states told 429Magazine that they do not recommend that students, even those conflicted about their orientation, undergo any program claiming to change or cure homosexuality. “We never provide reparative therapy, because being gay is not a mental disease,” says Cassandra Nichols, director of counseling at Washington State University “The APA has guidelines about this and we follow them. 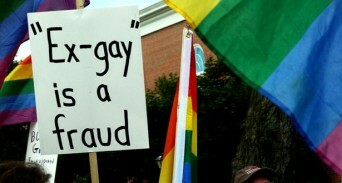 It would be unethical not to.” Gay reparative therapy is illegal in California and New Jersey. Virtually all LGBT groups reject the practice. Groups like NARTH still insist that the treatment is safe and that people should have the right to choose to undergo it if they wish. Posted October 21st, 2013 & filed under News.